The Novomatic Book of Stars Slot is part of the famous Novoline series of the Austrian software and slot machine manufacturer. The game is by far not as popular as the Book of Ra Slot, which has cult status among the slots fans. Nevertheless, the Book of Stars is worth playing! The five reels with three rows and 20 paylines has some great bonus features which are already known from other Novoline slots. This also includes an extra bet feature, wild symbols and of course a free spins feature! Symbols and payouts: The symbols of the Book of Stars are very elaborate and designed with many small details. Novomatic also used themed icons in this game, as well as the beloved playing cards symbols. The ace and the king are the best symbols here and pay on an active payline with 5 symbols 150x yor bet. But much more valuable are the two armlets with gods (Helios and Nyx), the golden owl Athena and the researcher symbol. Last mentioned pays the top price of up to 5000x your bet! But there is also the book symbol. Not only is it your Wild and Scatter, it also pays you up to 4000x your bet. Extra Bet and Wilds: The Book of Stars Slot is better than the Book of Ra Slot in one sense. There is an extra bet symbol here, which in fact is an extra wild symbol. So here you play not only with the Wild book symbol, but also with a magic ring, which is your second Wild. The ring lands on the reels 2, 3 and 4 only. The symbol replaces all other symbols as well as the scatter. This allows you to trigger Free Spins in combination with Book symbols. If you want to play with the extra game, you must also activate the extra bet. Free Spins feature: The Free Spins feature is the best bonus feature and you can make very good profits here. You can either trigger it with three book symbols, or with a combination of book and ring symbols when playing with the extra bet. You then get 10 free spins which you can extend with more scatter symbols. In the Free Spins you play with a special expanding symbol. This is randomly chosen before the Free Spins start. Especially with the more valuable symbols you can then achieve top profits! 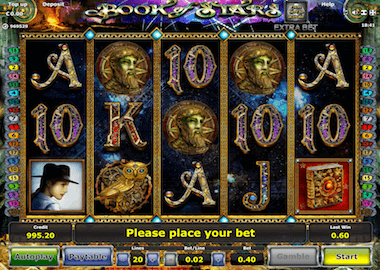 The Book of Stars Slot is undoubtedly a top Novoline slot, visually it is far better than most other Novomatic slots. Play the slot and many more other at the Ares Casino and Four Crowns Casino (Non UK). Other recommended online casinos with Novomatic slots are the LVbet Casino, Energy Casino and the Video Slot Casino. In the last mentioned casino you can play free spins without wager, which means a big advantage for you. Or you play the Book of Stars here for free. Just click on the banner above.